Hazelnuts, also known as filbert nuts, are a particularly good option because these marble-sized superfoods are pack with a potent nutritional punch. These nuts are slightly sweet and tasty nuts belonging to the Betulaceae family. Apart from being a tasty indulgence, hazelnuts can help reduce weight and maintain the health of the heart. Let’s see some of the amazing health benefits of Hazelnuts here on this page. Hazelnuts can be enjoyed raw, roasted, in a paste or as an ingredient in countless healthy dishes. Also, the rich, creamy flavor of the hazelnut is frequently used in sweets and coffee. The hazel fruits are borne in clusters and are held in a short, leafy capsule. Hazelnuts contain compounds that can battle heart disease and diabetes, boost brain function, and even help you lose weight. Hazelnuts are rich in dietary fiber, vitamins, and minerals and packed with numerous health-promoting phytochemicals. Altogether, they help protect from diseases and cancers. These tiny nuts are extremely fibrous and can help you feel fuller, longer, which can prevent overeating and promote weight loss. Hazelnuts are an excellent source of folate. A 100-gram serving provides 113 ugs of folate, amounting to 30% of the daily-recommended value. Folate is highly beneficial for pregnant women. It helps to prevent megaloblastic anemia and neural defects in babies. Hazelnuts have many vitamins and minerals that are powerful antioxidants. Antioxidants remove the damaging free radicals from the body and prevent major disease and illness like cancer and heart disease. Hazelnuts are a great source of vitamin E, which helps to fight aging and disease by reducing inflammation. One serving of hazelnuts can also provide almost an entire day’s amount of manganese, which is not an antioxidant but is a huge contributor to enzymes that are. Hazelnuts are rich in unsaturated fats that are extremely beneficial for the heart. The folic acid in hazelnut lowers the bad cholesterol and raises good cholesterol in the blood. 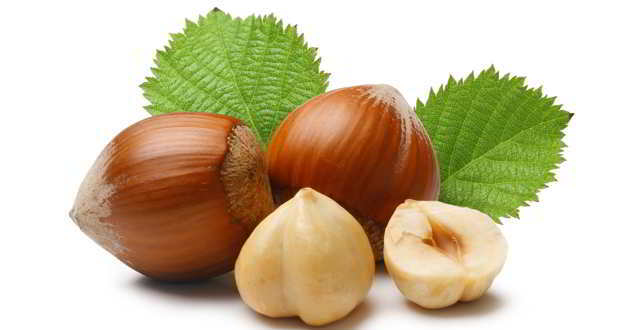 Regular consumption of hazelnut decreases cholesterol to a significant level. As these nuts are packed with antioxidants, they play a vital role in keeping your skin look healthier. The antioxidants combat the free radicals, which, if left untamed, could damage your skin. It also shields the skin from skin cancer induced by ultraviolet rays. This Vitamin E along with the fats of this nut helps in moisturizing and hydrating the skin. It, thus, conditions the skin, keeping it soft and smooth. The skin looks visibly radiant with the slightest tint of greasiness appearing nowhere. Hazelnuts are plump with Vitamin E, a great inflammation buster, and supporter of healthy brain activity. One serving of the small round tree nut provides your entire daily dose of manganese, which supports a healthy brain. A recent study by Nutritional Neuroscience showed that hazelnuts aid memory, and can even lower anxiety. With 32 mg of calcium in one serving, hazelnuts can help build strong bones, making these nuts a great choice for those avoiding dairy. The high levels magnesium and calcium present in hazelnuts can help you maintain and grow your muscles. Magnesium helps to rebuild muscle tissue, while proper levels of calcium can help prevent muscle fatigue and soreness. For gym junkies and fitness buffs, dosing yourself with hazelnuts can act as a great post-workout snack.